The Russian Federal Forestry Agency and the ECE-FAO Forestry and Timber Section are pleased to announce the organization of the seminar on ‘Forest Products and Technologies for the Future’ to be held at the Saint Petersburg Forestry Research Institute from 22 to 24 May 2013. Russia has more than a fifth of the world's forests, which makes it the largest forest country in the world. However, the considerable potential of Russian forests is underutilized and Russia's share of the global trade in forest products is less than four percent. The FAO Russian Forest Sector Outlook Study estimates that if the investment flow in the forest sector increases by five times from its current level of approximately $2 billion to about $10 billion per year, roundwood production in the Russian Federation will double by 2030 from 143 million m3 in 2010 to over 300 million m3. Under such favourable conditions, pulp and paper production should grow by 2030 from 7.7 million tonnes in 2010 to 25.5 million tonnes, the report says. Wood biomass for energy use in Russia will double, increasing from 32 million m3 to 75 million m3. The national market is envisaged to be the prime consumer with limited export only foreseen for pellets and originating from those regions with the necessary transportation and economic conditions. To achieve this vision, sound forest management practices as well as strong and balanced efforts are needed to create a stable investment environment and allow commercialisation of new technologies, efficiency improvements and further cost reductions along the whole supply chain. The workshop will look at the key technologies that can define the modernization of the Russian forest sector to maximize its potential as a global mitigator of climate change and an important source of timber in response to the growing demand for sustainable forest bioenergy. 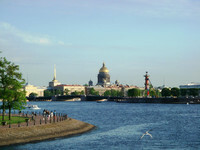 The workshop is jointly organized by the Federal Forestry Agency of the Russian Federation and the UNECE/FAO Forestry and Timber Section and will take place from 22 to 24 May 2013 at the Saint Petersburg Forestry Research Institute. The workshop is organized in the margins of an international conference on “Innovation and Technology in Forest Sector”. The meeting will focus on the key policies and technologies that could define the modernization of the Russian forest sector to maximize its potential as a global contributor to climate change mitigation and an important source of timber in response to the growing demand for sustainable forest bioenergy. The workshop is structured over two days followed by a field trip. The first day shall consist of presentations on forestry issues with a focus on bioenergy. Experts from international organisations, the public sector, research and academia will deliver an international perspective on various topics, while the local perspective will be presented by a Russian counterpart. The second day shall consist of 3 to 4 roundtables allowing participants to discuss an agreed theme. On 24 May, participants will have the opportunity to take part in a field trip. Interpretation services will be provided in English and Russian. The meeting documents and other logistical information for the session will be posted here as they become available. Participants requiring visas must obtain these from the Russian Consulate or competent Diplomatic Mission in their country before leaving for Russia. Visa applications must be submitted well in advance of departure. An invitation letter to facilitate your visa application will be provided by the Federal Forestry Agency of the Russian Federation upon request. The deadline for requesting invitation letters is 15 April in order to process the supporting documents in time with the respective Russian authorities. Participants failing to comply with the above will not be granted entry to the Russian Federation.